We tell you that Polaris expects big things from the 2017 Polaris 800 Titan SP 155 – it’s most extreme crossover, which has a 155-inch track length. You contain your enthusiasm. We tell you that track is 20 inches wide. Your eyes begin to roll. But, then we tell you that it is powered by Polaris’ 800cc Cleanfire twin and that the sled had serious design input from Polaris race team engineering. You’re confused. And not overly impressed, right? 155-inch long track? 20 inches wide? Articulated rear suspension? Race engineering? Really! That’s exactly how Polaris marketing and engineering staff thought the snowmo-media would react. Polaris felt that unveiling its all-new Titan series in conjunction with all its other new for 2018 models, including the new SKS 146 and Switchback XCR, would defeat the significance of the Titan and relegate it to “so what” status. To showcase the Titan, Polaris made a virtual standalone presentation at a Polaris new sled launch in far north Roseau County, Minn. The three Titan models starred. The new Titan stands tall — and wide with a 20-inch track width. Members of the snowmo-media weren’t the only ones that needed convincing that the Titan was more than a high-powered utility sled. In later one-on-one discussions with a few Polaris engineers not directly involved with the Titan project, we got interesting feedback as to how they viewed the Titan, that is, until they’d had a firsthand opportunity to put the sled through its paces. The more seat time everyone got with the Titan, the more their attitudes about it improved. Call us sick, weird or twisted, but we personally found the Titan to be one of the most interesting sleds of model year 2018. We’ve enjoyed it, well, immensely and asked to have a 2018 Polaris 800 Titan SP as a long-term review sled for next season. No, we’re not nuts. Admittedly not all of our veteran snowmobile athlete test riders chose the Titan as their first pick, but we did. Our second choice was Ski-Doo’s new for 2018 XRS 850. Simply put, while Ski-Doo’s XRS 850 exceeded our expectations for a race replica type trail sled in overall performance, it was ultimately what we expected the top sled in its category should be. The Titan, whether the “base” SP 155, the more aggressive XC 155 or the people moving Titan Adventure 155, totally surprised us. A long 150-something track length doesn’t automatically signal utility model anymore. Yamaha’s 200-horsepower Sidewinder B-TX is designed as a boondocking getaway sled with power, traction and backcountry chutzpah. The fact that the Titan goes all out with a Ripsaw format 155-inch track makes it a strong player off trail. Blend in its 20-inch track width and that rearmost articulation in the rear suspension and you have a sled that can take you places you might need to reconsider if you haven’t the experience in the wilds of snow country. Polaris’ new Titan may borrow from the RMK parts bin, but it adds nice-to-have features such as optional 4.3-inch Polaris Interactive Display, huge cold-cheating windscreen, storage options, and standard electric start. A 155-inch track length, 20-inch track width and articulated suspension design can get you into the boonies, but adding in a specially designed high and low range gearbox to meld with the Polaris P85 primary clutch and new Team Boss driven ensures the ability to get back from virtually any adventure. Historically there have been sleds equipped with most of the Titan’s base components, but none have had the performance of the Titan. 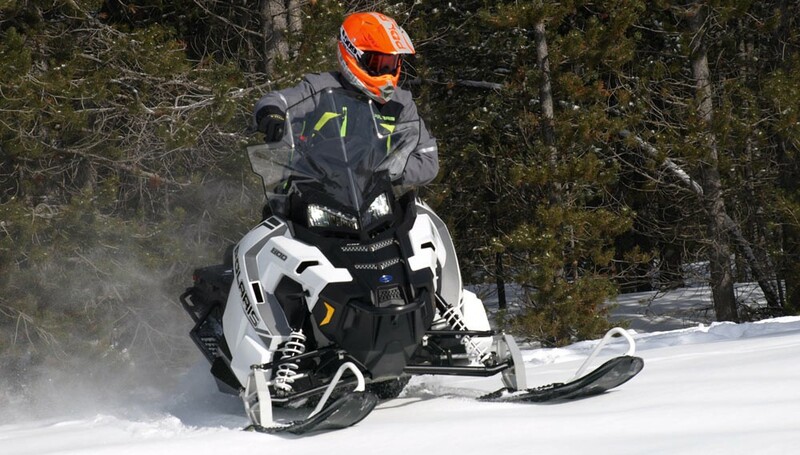 The incorporation of the proven and potent 800cc Polaris Cleanfire twin adds a new dimension to versatility sleds. That’s what the Titan is, a full-fledged sport-versatility sled. To add sporting performance, Polaris brought on engineers well versed in the art of making racing sleds. Imagine being those engineers. Your boss comes to you and tells you that you’ve done a good job with race sleds, but now we want you to create a sporty utilitarian wide track unit with a 155-inch long foot print. Yeah, that must have felt like being sent to Siberia. But, if you’re going to the Urals, how about having the most performance? So, you get your boss to leave you alone to create a sled you, a racing-inspired engineer, would ride. Out of the Polaris parts bins, what do you piece together? Obviously, you want a wide and long track. Why not a fully featured Ripsaw design with 1.375 lugs on a “base” model, the SP. Yes, the ultimate end user will ride fundamental trails and you’ll need front end flotation, but you may still want to carve a corner when on a good trail system. You opt for a special Pro-Float ski that has a surface area 45 percent greater than a trail-oriented Pro-Steer ski, but through is unique under ski design it can grip and rip through a turn and provide necessary off-trail front flotation. The special Pro-Float ski has a surface area 45% greater than a trail-oriented Pro-Steer ski and through its unique under ski design it can grip and rip through a turn and provide necessary off-trail front flotation. When first we rode the 2018 Polaris 800 Titan SP, we were put off by the Pro-Float as they seemed extremely wide and we thought cumbersome on the trails in Roseau and at the ride reviews in West Yellowstone. Duh, what we learned was that looks were truly deceiving as the width didn’t interfere with the trail grip but enhanced it in ungroomed trail sections. We ended up liking the front-end handling of the SP version over the more aggressively outfitted XC version, which uses Polaris’ Gripper ski and Fox QS3 clicker shocks instead of the more fundamental Polaris internal floating piston shocks of the SP. When piecing together the Titan, Polaris engineers borrowed quite liberally from the deep snow models, creating a Titan-specific version PowderTrac running board to keep snow from building up when in deep powder areas. The gnarled top of the running board adds a secure foot position. Shift into reverse and feel the articulated rear suspension step over obstacles. Of course, when starting from scratch in creating a new niche of sleds, Polaris engineers went with the rider balance of the AXYS style chassis. Although the Titan is a bigger platform, it’s only 129-inches in overall length, only eight inches more than the new 2018 800 Switchback XCR. The AXYS front suspension borrows from RMK concepts and the articulated rear suspension may be new for 2018 but its philosophies come from past designs. What is new and unique to the Titan are things like the use of an automotive-type power boosting regulator to maintain maximum electrical power at low revs and provide consistent wattage for heated heats, battery charging and a myriad of electrical options like the integrated 1500-pound winch accessory. Outfitted with a 14-gallon fuel tank, the Titan can haul up to 1200 lbs thanks to its Alpha transmission with high and low range. The sled can easily be fitted with options thanks to its new Lock & Ride Versa storage rear deck. Not the same as seen on Polaris ATVs, the Titan cargo platform shares the versatility and design concept. The Titan can be fitted with a catalog of options thanks to its new Lock & Ride Versa storage rear deck, which shares the versatility and design concept as seen on Polaris ATVs. Even if you must travel in marginal snow to reach a destination, the 2018 Polaris 800 Titan SP should see no problem as it’s equipped with an efficient cooling system that includes a radiator. In testing Polaris proved the cooling capability when test engineers had to travel a few miles over a rocky, rutted forest road to get to a snowy staging area. That, of course, is the work and versatility side of the Titan. Things that we liked were the incredible holeshots we got when the 800cc twin snapped through the drive and that 20-inch wide Ripsaw track gripped the snow with unexpected enthusiasm that could embarrass a high-performance sport sled. The Titan is quick on its feet through an eighth mile. Move this shifter into the Alpha transmission’s high or low ranges and let the Titan haul up to 1200 lbs. It’s also limber enough to be planted on its side for a quick pirouette to change direction. Of course, we only witnessed that maneuver being performed by one of the Titan’s design engineers. But it proved to us that the Titan, even at its claimed 600-plus pounds, can handle like a shorter, lighter sled. The 2018 Polaris 800 Titan SP amazed us with its versatility, all-around performance, winter cold cheating styling and on or off trail prowess. Yes, on first blush a sled with an articulated rear suspension to accommodate a 155-inch long by 20-inch wide track wouldn’t have struck us a performance sled. But, we had yet to ride the Titan. Very good and accurate review!